NFPA 51B is the nation’s most comprehensive document on hot work safety. Stay up-to-date and help keep personnel safe. Hot work can be dangerous, especially when combustible materials are in the area. NFPA 51B, Standard for Fire Prevention During Welding, Cutting, and Other Hot Work helps you reduce the risks associated with hot work projects. Requirements cover welding, heat treating, grinding, and other applications likely to produce sparks or flames. The current edition of NFPA 51B is a must-have resource for anyone conducting hot work operations in any setting. This trusted welding standard provides general requirements to help ensure that those involved with hot work are addressing fire and explosion hazards, prevention, and safety practices in areas where combustible materials could spark or ignite from the hot work being performed. It also offers clear guidance on managing the activities and safety requirements of permit-authorizing individuals (PAIs), fire watch, welders, fire marshals, and hot work operators -- in any setting where hot works are done. NFPA 51B covers the safe use of welding, cutting, heat treating, grinding, and hot work equipment. Whether you're a contract welder or a fire chief, it's essential to familiarize yourself with the current requirements for hot work safety. NFPA 51B covers far more than permit areas -- this document also pertains to areas that are designed for hot work. Reference this standard for clear instructions and the latest information on the use of equipment such as welding blankets, curtains, and pads. 4.2 Permit Authorizing Individual (PAI). 5.6 Fire Watch and Fire Monitoring. 6.1 Assignment of PAI and Fire Watch. 6.2 Written Hot Work Permit. Trust the 2014 NFPA 51B to help clarify activities and safety precautions for anyone conducting hot work operations, in any setting! 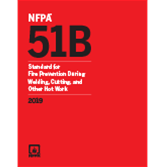 NFPA 51B provides clear instruction on safe use of welding, cutting, heat treating, grinding and hot work equipment such as blankets, curtains, and pads.